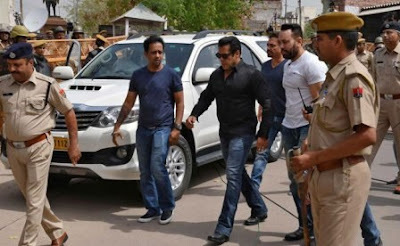 Finally, Superstar #SalmanKhan is granted bail in #BlackbuckPoachingCase, where the actor is sentenced five years in prison and 10000 rupees fine. Amidst all the reshuffling in Rajasthan, earlier it appeared that the actor might have to spend few more days in Jodhpur prison, but Judge granted him bail and the actor soon will return to Mumbai. The hearing on actor Salman Khan's application for bail and suspension of sentence in the 1998 black buck poaching case has been completed and the order has been passed, the actor is granted bail. Khan's release was ordered on a bail bond of Rs.50,000. The court also allowed suspension of sentence during the pendency of Salman's appeal against his conviction. District and Sessions Judge Ravindra Kumar Joshi heard the arguments of prosecution and defence which lasted for about an hour, defence Counsel Mahesh Bora said.Khan's sisters - Alvira and Arpita - were present during the hearing. The actor was on Thursday convicted by a trial court and sentenced to five years in prison for killing two black bucks during the shooting of "Hum Saath Saath Hain". The sessions court had yesterday reserved its decision on Bollywood superstar's bail plea for today and called for the records of the case from the trial court. Salman Khan will soon starts promoting his forthcoming movie Race 3.